Tri Fold with Business Card Holder Wall or Counter Top. CLEAR ACRYLIC FREE STANDING, HOLDS 4W BROCHURES. Versatile: Both a desktop and wall mount holder using keyhole feature. Slant Back Trifold Literature Holder With Card Holder. For material up to 4 wide. Product dimensions: 4-3/8" wide x 7-3/4" high x 4 deep. 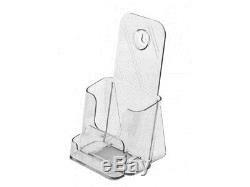 The item "Lot of 50 CLEAR Acrylic 4x9 Tri-Fold Brochure Displays with Business Card Holder" is in sale since Tuesday, May 06, 2014. This item is in the category "Business & Industrial\Office\Office Supplies\Desk Accessories\Business Card Holders". The seller is "marketingholders" and is located in Cocoa, Florida.